Dallas/Fort Worth International Airport is one of the many gateways to the United States. The second largest of all the airports in the USA, DFW is bigger than the island of Manhattan! The airport’s incredible size has led to it having its own postal service city designation, zip code, and even its own police, fire protection and emergency medical services. Dallas/Fort Worth International Airport (IATA code: DFW) is the third busiest airport in the world by aircraft movements and a hub for American Airlines, Ameriflight and UPS Airlines. Flights to Dallas/Fort Worth International Airport are provided by international airlines such as British Airways, Emirates and Lufthansa. DFW is a 30-minute drive from the city centre of Dallas and a 30-minute drive from Fort Worth’s city centre. Book your cheap flights to and from Dallas/Fort Worth International Airport online! Dallas/Fort Worth International Airport, one of the busiest airports in the United States, serves the Dallas-Fort Worth metroplex area. In 2016, the airport reached a record high, welcoming more than 65 million passengers through its doors. Nearly 900 flights depart from and arrive at DFW. This gateway to the USA and launchpad to the rest of the world offers a wealth of entertainment attractions, eateries, shops and numerous services to ensure you get a wonderful start to your trip to the state of Texas. 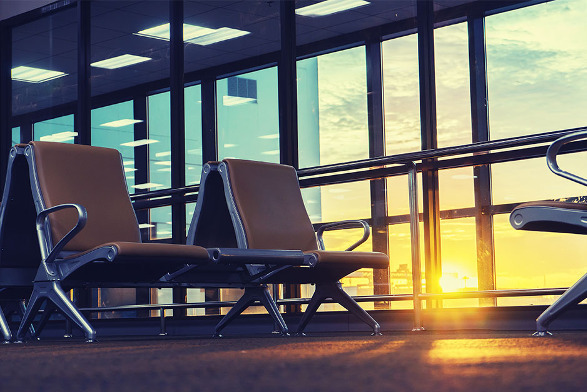 Dallas/Fort Worth International Airport is home to 5 huge terminals, namely Terminals A, B, C, D and E. Prepare to discover a beautiful scene at this airport that serves North Texas. With the wealth of attractions, services and facilities available for you at the airport, it’s no surprise to find a variety of retail outlets situated throughout DFW’s 5 terminals. These many shops sell a range of items, including accessories, gifts, books, news, children’s products, educational books and media, electronics, sports, duty-free products, as well as tax-free products. When all the shopping is out of the way, you’ll be able to relax and satisfy your appetite with various meal options at a wide selection of eateries selling classy dishes, tasty fast food, sweet desserts, refreshing beverages and relaxing drinks. The international airport serving Dallas and Fort Worth features several lounges throughout the terminals, operated by numerous airline clubs, such as American Airlines, British Airways, Delta Air Lines, Korean Air, Lufthansa, Qantas and United Airlines. These lounges include features such as W-Fi internet, work stations, conference facilities, newspapers/magazines, TVs, shower facilities, beverages, snacks and more. While exploring Dallas/Fort Worth International Airport, make sure to follow the baggage restrictions to avoid any potential delays. Take a walk around the airport and discover the various paintings, sculptures and incredible medallions decorating the vast interior. If you head outside, there’s also the beautiful sculpture garden. If you have plenty of time before your next flight, enjoy a stroll along DFW’s walking path. Endorsed by the American Heart Association, this scenic course includes informational signs about each of the twelve medallions. Other services and facilities that you can enjoy at this airport include animal relief areas, hairdressers, barbers, charging stations (for laptops and mobile phones), a massage therapist, pedicures, manicures, priority passes, currency exchange outlets and free Wi-Fi. Comfort Suites DFW Airport This modern 3-star hotel in Las Colinas is a 10-minute drive from Dallas/Fort Worth International Airport. Amenities include an outdoor pool, fitness centre, business centre, coffee/tea in the common area, air conditioning, daily housekeeping and multilingual staff. Free full breakfast, free parking and free Wi-Fi are also available. Hyatt Regency DFW This magnificent 4-star hotel is a 2-minute drive from the nearest terminal of DFW. Its numerous features include 3 restaurants, an outdoor pool, breakfast, 24-hour fitness centre, 24-hour business centre, 24-hour front desk, air conditioning, limo service and daily housekeeping. Additionally, this establishment offers free airport shuttles and free Wi-Fi. Rosewood Mansion on Turtle Creek This 5-star luxury hotel with a spa is a 25-minute drive from the airport. Its many features comprise of a restaurant, bar/lounge, full-service spa, outdoor pool, breakfast, 24-hour health club, 24-hour business centre, terrace, valet parking and a limo/town car service. A free children’s club, free area shuttles and free Wi-Fi are available as well. The following documents are required when ordering/collecting foreign exchange. Travelex has one outlet in Terminal A, as well as several others in Terminal D.
Dallas/Fort Worth International Airport features more than 20,000 parking spaces, available for short and long-term parking (90 days maximum). You can book a parking space on the airport’s website. Dallas/Fort Worth International Airport sits 25 km to the northwest of central Dallas and 30 km to the northeast of central Fort Worth. Taxis, buses, limousines, charter buses, trains, Uber and car rental options are available to get you from the airport to your destination.